Tea tree oil also known as Malaleuca oil is from the Maleleuca Alterniflolia tree. These trees are found in Australia. It was first used by Indigenous Australians to prevent colds and flu. Antiseptic-because of it's antibacterial properties, it is able to be used as an antiseptic to treat cuts and burns. I have even used tea tree oil in a spray bottle for ear piercing. Treat Acne-It takes a lot longer than benzyl peroxide to see visible results (2 weeks vs 1 month) but you'll notice that tea tree is the better choice because it has fewer side effects. I'll create another post about this. Treat Dandruff- It has been known to treat mild to severe dry scalp, also known as seborrheic dermatitis. Treat Head lice-Studies have suggested head lice is less likely grown to become resistant to natural treatments unlike formulas like KP24 but formulas like KP24 solution have been known to be more effective. Treat Athletes Foot- This is due to it's anti-fungal properties. Treat Fungal Toe Infections- This treatment is the most effective budget alternative to expensive treatments like well known ones such as Canesten and Loceryl (which costs from $70). It is as simple as filing the nail and applying tea tree oil on the area with a cotton bud. Treat sinus and chest congestion- It's antiviral properties can treat colds and flus. It is as simple as inhaling the product. Used as an antiperspirant/deodorant- If you like the smell, you'll love this natural alternative but personally I prefer using crystal deodorants. Cons: It has a potent smell which people either love or hate (apparently smells like camphor). When I first used it my mum thought it was the smell of mould. I think you'll grow to like it. Pros: It is antibacterial and effective for removing stains. When it came into contact with my nail polish, my nail polish was instantly rubbed off. I wouldn't recommend using it as a nail polish remover just because there are cheaper alternatives out there. 100% Tea tree oil is yellow in appearance. It comes in an opaque bottle so that it is not affected by the sun. I recommend purchasing the 20% solution. I find you get all the benefits of the 100% but without the side effects if you are using it for personal use. It is also a fraction of the price in comparison to the 100% solution. In Australia, the cheapest at the moment is in ALDI. You can also find this at a decent price in discount pharmacies in the antiseptic section. Those with extremely sensitive and dry skin like mine might have a slight reaction to the product, after prolonged use. To prevent it and to treat it I use colloidal oatmeal moisturizer such as Dermaveen which almost soothes it instantly and keeps the skin moisturized. I still love tea tree oil because it has dramatically controlled my acne (I'll make another post soon about it). Also, it is toxic to ingest this product. It was also recently brought to my attention that tea tree oil should not be applied in the ear (to treat infections) because studies have shown that it damages the nerves and causes hearing impairment. Further studies are being done at the moment so I'll keep you posted on any new information that I find. I just found your blog through one of your makeupalley posts. Just wanted to add a word of caution. Some studies have suggested tea tree oil can cause damage to nerves in the ear, so I wouldn't recommend using it for middle ear infections. Other than that, great post on all the uses of tea tree oil. I use it for acne, and it's been a lifesaver for me! I buy the 100% oil and dilute it with water or jojoba oil. Thanks for the warning about tea tree oil and damages to the nerves in the ear. It's such a pity because it really did help me :(. I'll make sure to remove it from my list. 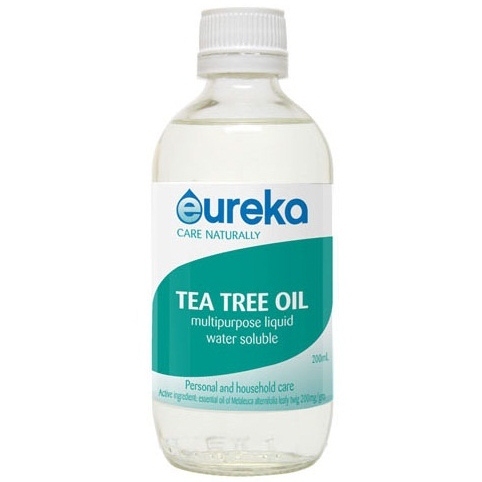 I have tried diluting tea tree oil with other products but it has been unsuccessful because the oil sits on top. I find that I have to shake the mixture before I use it.